Item3 - Zwischenpräsentation "Das Wissen des Stadt"
IBA Heidelberg is a German Architecture Exhibition in the city of Heidelberg, DE, from 2013 to 2022. Its theme is "Wissen | schafft | Stadt" (Knowledge | makes | City", a play on word on "Wissenschaft" which means "science." 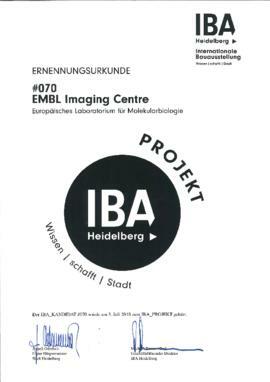 Promotional material and the EMBL Imaging Centre "IBA Projekt" certificate.